Whole wheat biscuits are flaky and decadent, like you’d expect. 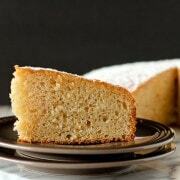 What is unexpectedly delicious is the crunch of cornmeal and flavor of cheddar and pepper. Biscuits, who doesn’t love them? Flaky, buttery, and comforting. Perfect at breakfast, lunch, or dinner. No yeast to deal with, no waiting on your bread to rise. No kneading required. Perfect on soups and stews, perfect as the base of a breakfast sandwich. Divine smothered with sausage gravy. I fell in love a little more with biscuits just writing that paragraph. 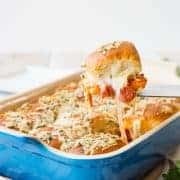 Perhaps it’s the craziness of having young children and a full-time business squeezed into part-time hours, but something tells me I’ll always love a quick and easy recipe that doesn’t require kneading. While I obviously love a good yeast bread (this cinnamon vanilla bean swirl bread is to die for! ), I hardly ever make a homemade loaf. The reason is twofold, first of all because I’ll eat the whole dang thing, and secondly, because of the time required. I don’t foresee this changing even when the kids are older. I’m sure there will always be something to fill my time, but there is something magical about a homemade loaf of bread baking in the oven. Perhaps it is because it’s practically magic when it actually happens in my house. In the meantime, we have muffins and biscuits to fill our home with the irresistible smell of a homemade baked good in the oven. Even though they don’t contain magical yeast, biscuits are still something special in my home. 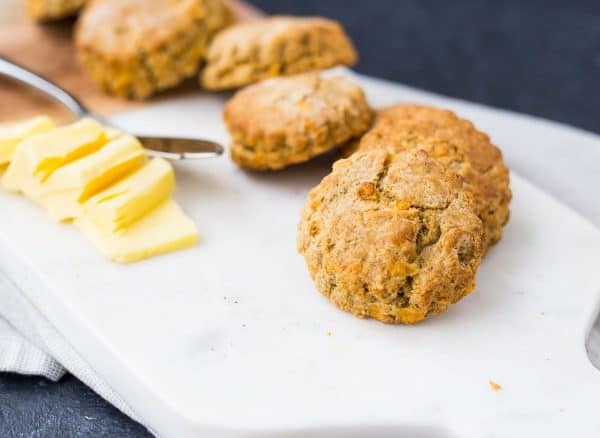 I don’t make them regularly because when prepared traditionally, they aren’t the most nutritionally rewarding thing you could eat (but if you’re looking for more of a classic recipe, you’ll love these herbed buttermilk biscuits, they are amazing with beef stew!). My goal is to always make recipes a little healthier and more wholesome. One of the reasons I love partnering with Bob’s Red Mill is because they make this so easy with their huge line of products – switching from quinoa to freekeh to farro to barley keeps me from getting bored with healthy eating. I can also count on them for quality staples like their whole wheat organic flour that I used in this recipe. I used 100% whole wheat in addition to some cornmeal for crunch and I loved the way these turn out that way, but if you or your family isn’t accustomed to eating whole wheat baked goods like we are, I’d recommend starting with a 50/50 ratio of all-purpose flour and whole wheat flour. 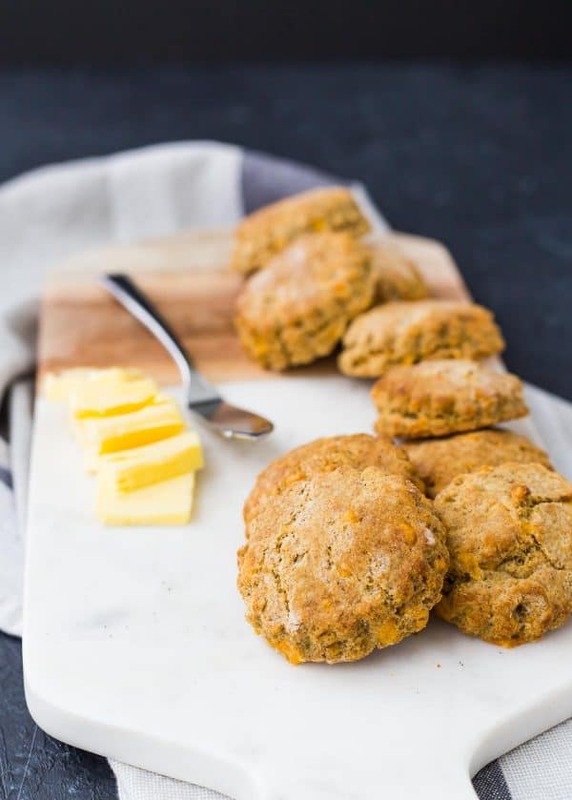 I added a touch of cheddar cheese and pepper in these biscuits (I fell in love with that combo ages ago and I haven’t stopped using it!). 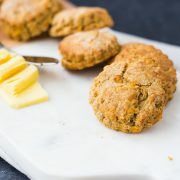 These whole wheat biscuits would be absolutely perfect for any spring event, but I’m picturing them alongside that Easter ham or with ham leftovers! 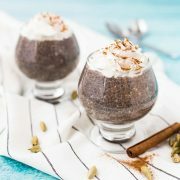 Or if winter is hanging on in your neck of the woods, try these with some beef stew. Looking for more biscuits? 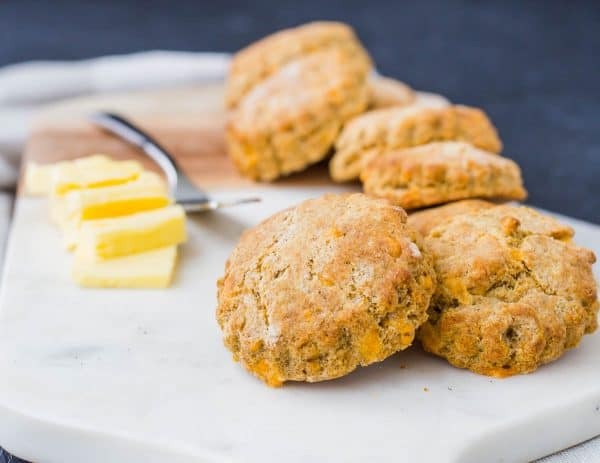 I’m excited to try these Cheddar Bay Biscuits from Mom on Timeout and Pumpkin Sage Drop Biscuits from She Wears Many Hats. Whole wheat biscuits are flaky and decadent, like you’d expect. What’s unexpectedly delicious is the crunch of cornmeal and flavor of cheddar and pepper. In a large bowl, whisk Bob’s Red Mill whole wheat flour, cornmeal, baking powder, baking soda, salt, black pepper, sugar, and sharp cheddar. Cut in butter using a fork, pastry cutter or your hands, mixture should resemble fine crumbs. Stir in buttermilk until combined. Roll out dough to 1/4- or 1/2-inch thickness on floured surface and use a biscuit cutter to cut into rounds (my biscuit cutter was 2 1/4 inch). Place on a cold or room-temperature baking sheet about 1 inch apart. Bake for 12 minutes or until golden brown. Best enjoyed fresh and hot. Note: If you’d like, you can use a combination of whole wheat and all-purpose flour. 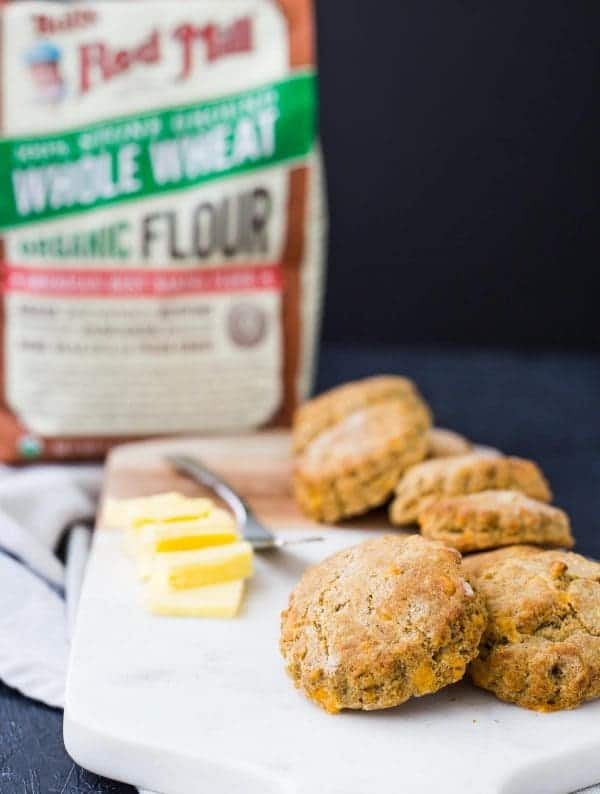 We’re very accustomed to eating whole wheat baked goods, but if you’re new to using whole wheat, start with 3/4 cup of whole wheat flour and 3/4 cup all-purpose for this recipe. Note: Yield depends on thickness as well as size of biscuit cutter. Verdict: These are everything I want from whole wheat biscuits. Flaky and buttery but still with that heartiness you’d expect from whole wheat flour. They also have an addicting crunch from the cornmeal. Husband’s take: Ben loves these, my mom loved them, my mother-in-law loved them, and N enjoyed one too (with honey!). I am a big biscuit fan and love that these are a little healthier, but still look and sound super tasty!! Cool gadget, but I’ll let Bob’s Red Mill handle the hard work and I’ll stick to the baking. ;) Their products are so fantastic that I don’t have to take that extra step. Thanks for reaching out, though!